Our customers like to talk about a maximum operating pressure or working pressure. Unfortunately, these two terms are not defined for pressure sensors, which means that a definitive answer cannot be given. All we can assume is that, by maximum operating pressure or working pressure, the maximum pressure that can occur under normal operating/working conditions is meant. However, it is also possible that it is understood to be the maximum pressure that could occur – including the event of a failure. Therefore, from the point-of-view of a pressure sensor manufacturer, it is not so easy to clarify the terms maximum working pressure or operating pressure. 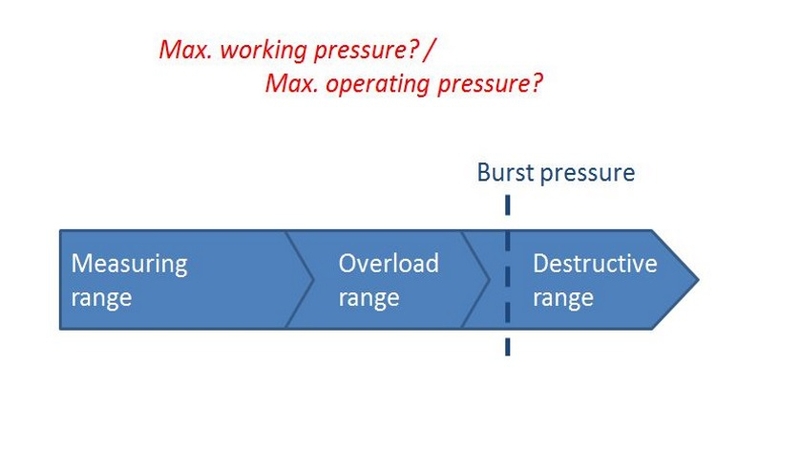 What we can do, however, is to clarify the corresponding terms for each pressure sensor: Here we differentiate between the measuring range, the overload range and the burst pressure. Here, you can also see our article “How does a pressure sensor behave in the overload range, that means outside the measuring range?”. Perhaps the definition of these three terms can help you in specifying the right pressure sensor for the pressure conditions in your system. These terms can also be found in DIN 16086. Should you need any further help or advice, your contact will be glad to assist you.